Currently, 43.63 percent of India speaks Hindi including languages such as Bhojpuri that are fighting to be accorded separate status. Between 2001 and 2011, Hindi grew at a rate of 25 percent, adding about 100 million new Hindi speakers. The Office of the Registrar General and Census Commissioner of India on June 26, 2018 released the 2011 Census data on Language and Mother Tongue. The Language Census 2011 represents an updated linguistic scenario. As per the 2011 Census data, there is a rise in number of Hindi speakers, however, speakers of South Indian languages and Urdu dropped down. • As per the 2011 census, 43.63 percent of Indians speak Hindi as their mother tongue. • Bengali, with 8.03 percent speakers, is second in the list, followed by Marathi at 3rd with 6.86 percent speakers, Telugu at 4th with 6.7 percent speakers and Tamil at 5th with 5.7 percent speakers. • In all, 13 of the 22 scheduled languages were reported as the mother tongue by at least 1 percent of the population. • Except for Sanskrit, each of the 21 scheduled languages was reported as the mother tongue by at least 10 lakh people. • Sanskrit is the only language that is spoken by a set of around 25000 people. Hindi is the most spoken Indian language. It is one of two languages used by the Union government, the other being English. Among the 10 largest languages in India, Hindi is the only one that saw the rise in the proportion of its speakers. The language has been witnessing the growth since 1971, driven mostly by high population growth in the Hindi-speaking states. The lower population growth in the five Dravidian language-speaking states, namely Tamil Nadu, Karnataka, Kerala, Andhra Pradesh and Telangana has resulted in the fall in proportion of Telugu, Tamil, Kannada and Malayalam language speakers. While Hindi grew by 161 percent between 1971 and 2011, these four largest Dravidian languages grew at half that rate that is at 81 percent over the same period. The 1981 census data for Tamil language was lost in a flood and is unavailable. The data for Tamil has been inferred by observing the change between 1971 and 1991 census data. The growing movement of people from north to south has led to greater presence of Hindi in the five southern states. In Tamil Nadu, the proportion of Hindi speakers nearly doubled from 2001 to 2011. However, in some cases, this growing migration from North to South resulted in agitation such as in Bengaluru, Karnataka; the government was forced to remove Hindi signages from the city metro. 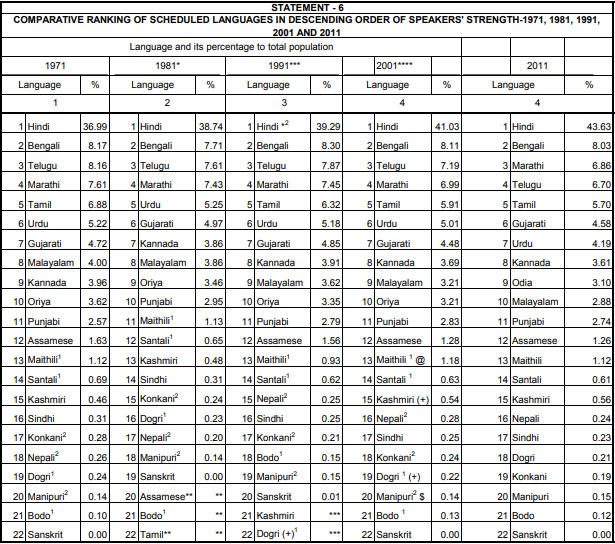 As per the language census data 2011, two scheduled languages, Urdu and Konkani, saw fall in absolute numbers. There are 50772631 Urdu speakers in India, a fall of about 1.5 percent since 2001. The decline in Konkani speakers is 9.5 percent. Urdu speakers are spread across India but the language’s strongest presence is in the two largest Urdu-speaking states - Uttar Pradesh and Bihar. The Urdu language in modern India is associated only with Muslims, however, this fall in Urdu speakers is strange as the Muslim population in Uttar Pradesh and Bihar has grown between 2001 and 2011. 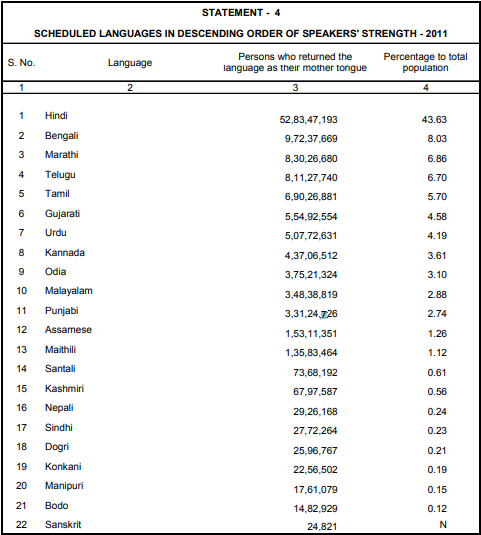 As per the 2011 census, Bengali, with 8.03 percent, is second in the list after Hindi in terms of percentage of speakers. As Hindi language, Bengali too spreads to other states with migration. The language is spreading to the south and west, there are 4.4 lakh Bengalis in far-off Maharashtra and 2.2 lakh in Delhi. In South, the numbers are small, however, they are growing. In Kerala, the proportion of Bengali speakers has grown nine times. The sharpest language divide of India exists in Assam, where a proposed citizenship law and National Register of Citizens have divided the state’s Assamese and Bengali speakers. Assam is the only major state that does not have any language group in a majority. Assamese speakers, the largest group, make up 48 percent of the state, however, the proportion of Bengali speakers went up in 2001-2011. The National Register of Citizens is a project that aims to create a definitive list of citizens of the state and identify illegal immigrants. English seems to have registered a 15 percent jump in number of speakers since 2001, making it one of the fastest growing languages in the decade. The lesser-known tribal languages spoken in remote corners of India have shown a decline, as per the findings of the 2011 Language Census. • The primary objective of the Linguistic Survey of India is to present an updated linguistic scenario. • The census followed a certain methodology to arrive at these findings. It defined “Mother tongue” as 'the language spoken in childhood by the person’s mother to the person. If the mother died in infancy, the language mainly spoken in the person’s home in childhood will be the mother tongue'. • There are total 121 languages that are considered as mother tongues. Of these, 22 languages are included in the Eighth Schedule of the Indian Constitution. • The 22 languages included in the Eighth Schedule account for the mother tongue of 96.72 percent Indians as per the 2011 census.